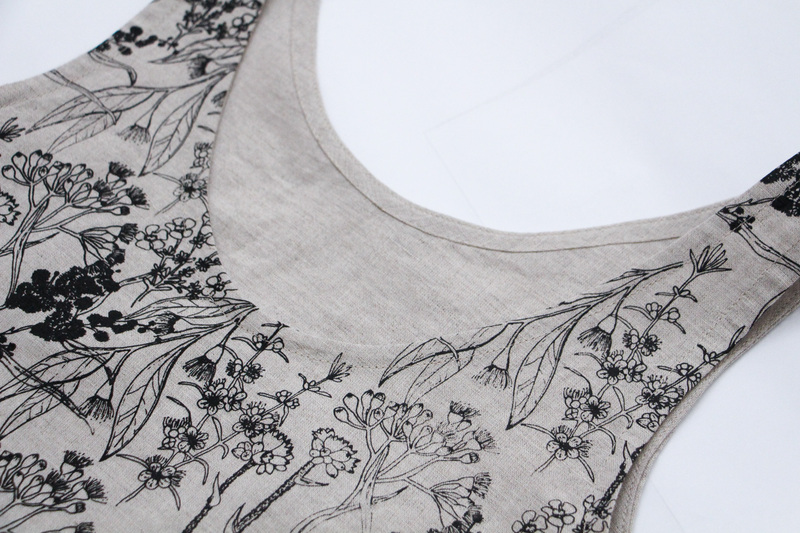 I’m so thrilled to show you the first thing I have made with my self designed screenprinted fabric! 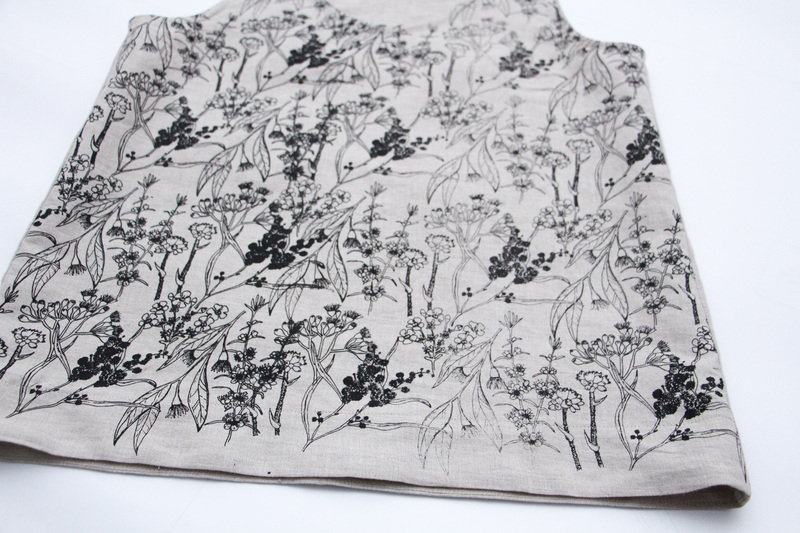 I found it incredibly nerve wracking to cut into this fabric. I had too much I wanted to make with it, and the stakes felt too high – what if i wrecked it? I only had 1m! 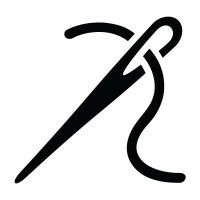 If you don’t cut fabric, you can’t make anything. And if you don’t make anything, you can’t enjoy it. I tried to think strategically about what i could fit out of my small yardage, and decided on a Eucalypt tank top and two throw cushions. 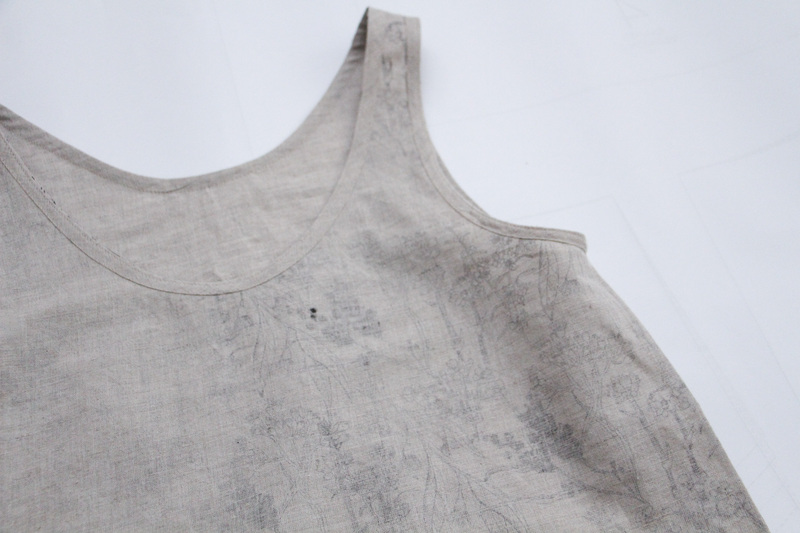 I still had leftover linen that I hadn’t printed, so I cut only the front of the tank from printed fabric, and cut the back and all the bias facings and hem facing from plain linen. I am really pleased with this choice, i feel like it makes the front print more special that it is only one panel. Here is a little look at the inside of the tank – for some reason that i can’t really explain, i really enjoy looking at the wrong side and seeing how the print shows in some places, and how the ink bled through a bit. My one regret is that i chose the “worst” section of printing for this top. You probably can’t tell, but my obsessive perfectionist streak doesn’t like that one side is printed more heavily, and one side is printed more lightly. I prioritised the best sections for the cushions as i thought i’d use cushions more often. Stupidly, I haven’t actually sewn the cushions yet, and have you ever witnessed me sew a cushion, like ever? 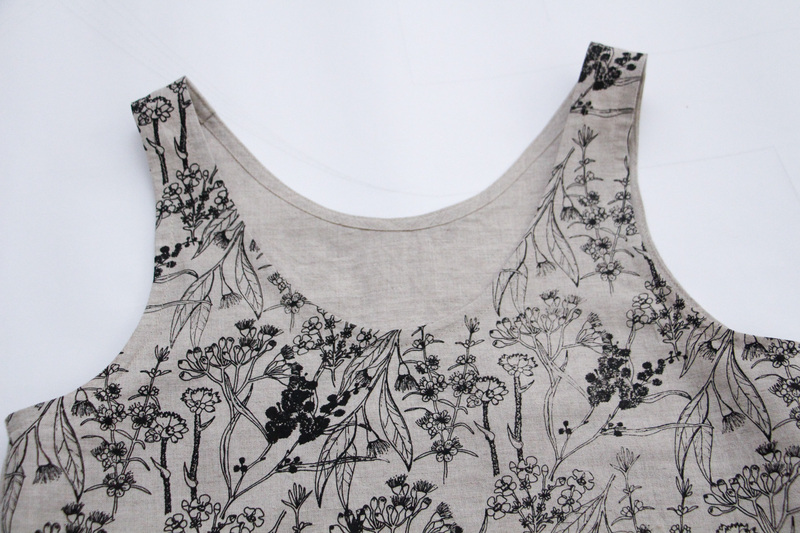 If you’d like to read more about how I designed and printed my fabric, check out this post. I agree with Big Red – if you hadn’t said it was a “mistake”, I would’ve assumed it was an intentional fade effect. It looks amazing! I’m always amazed at the synchronicity when reading your posts Megan! 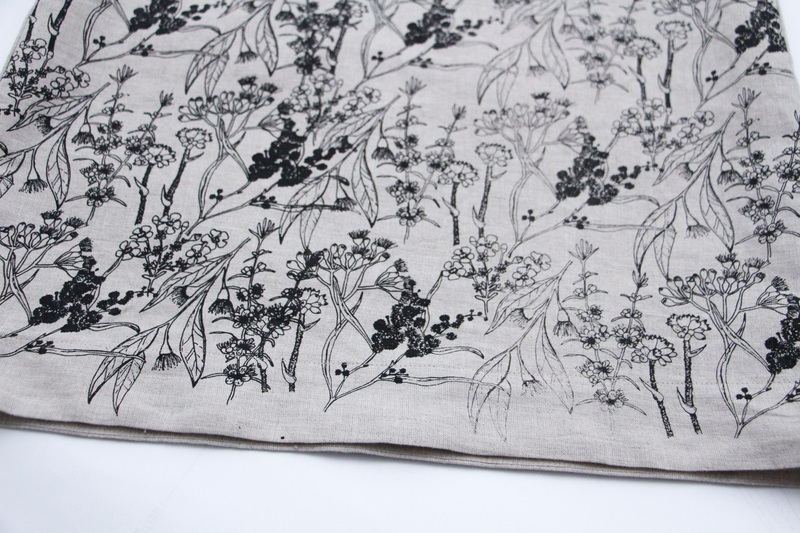 I have your Eucalyptus pattern (printed copy) sitting on my cutting table right now (and I’ve had it in my stash for more than a year!) I couldn’t agree more that there is oftentimes nothing more useful than a simple make – I’m excited to make up a few of these for summer (I’m in Canada) in many different fabrics but linen in high on my list for sure. 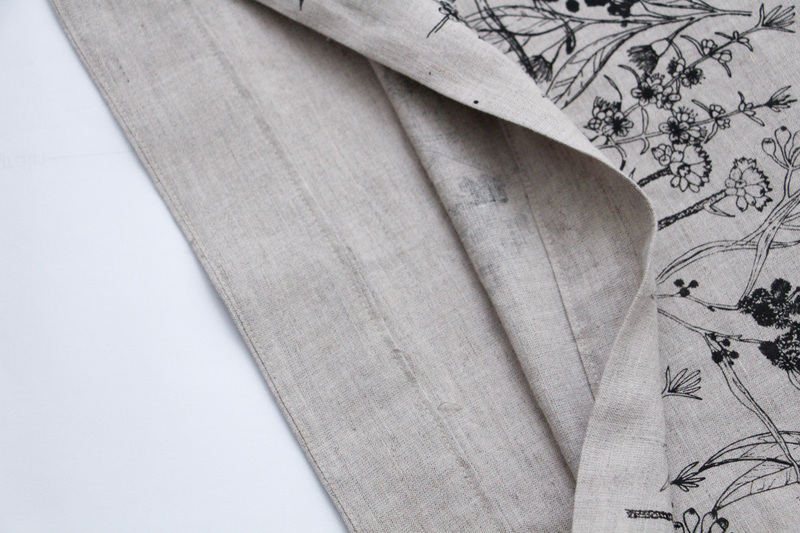 Yours is lovely and for sure I GET why you were nervous about cutting into your handmade fabric – I have enough trouble when it’s “ordinary” linen, never mind one I’ve lovingly designs and had printed! Everything about this is beautiful! The delicate design, the intensive process, the gorgeous final make – all inspiring & lovely. I would’ve had a hard time cutting into it, too (your rationalization for doing so is a good reminder)! One of my favorite things about printmaking is the unique quality each print has. What you may see as an imperfection, I find to be a one-of-a-kind treasure. Bravo & thanks for sharing! This is truly lovely. What a great gift (the class)! 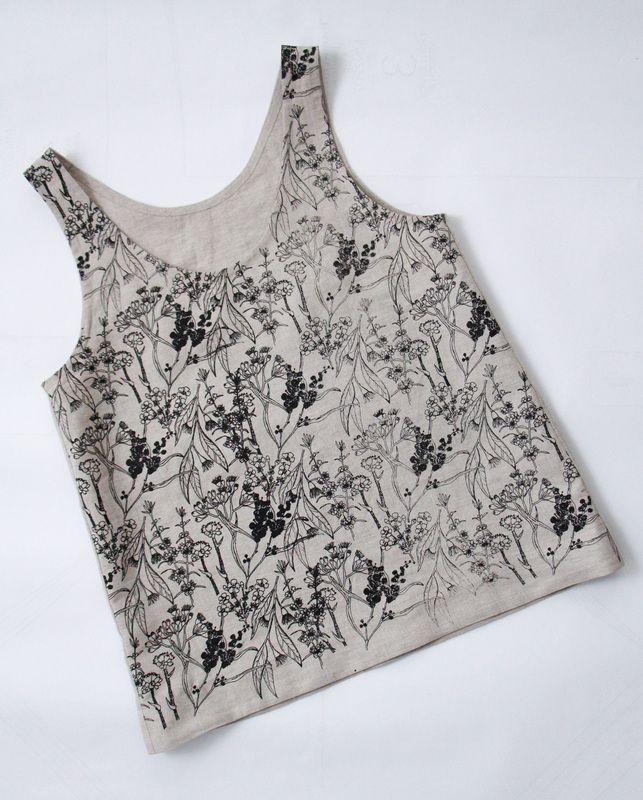 I like how you used the native floral of Australia, and the dense but delicate pattern looks so nice. Also, I thought the printing ombre was intentional. What does it look like when worn? This looks amazing! And the fact that you designed the fabric makes it so special. Good luck making those cushions!